You're not going to find a more intelligent conversation about the Oscar nominations than Charlie Rose's discussion with film critics A.O. Scott and David Denby. Watch the video here (their chat starts at 14:05). Oscars - Who Will Win? Animal Collective's new album gets better and better each day I listen to it. I'm pumped for their Saturday show at the Troubadour. 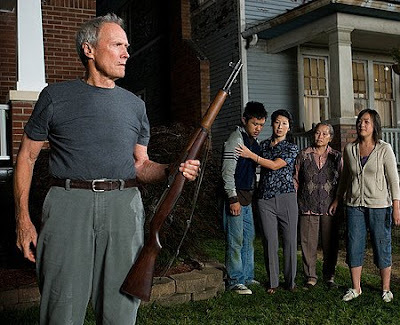 I wasn't planning to write about Clint Eastwood's Gran Torino. But now the movie is doing well at the box office, and whispers are circulating that it might even slip into the Best Picture race. If Gran Torino gets nominated for Best Picture, that's it, I'll be done with the Oscars. It's the worst movie I saw this year, and the mere idea of it being rewarded with a Best Pic slot is sickening to my stomach. It's sickening because it means so many other more deserving films (e.g. WALL-E, Doubt, The Wrestler) will be overlooked in order to serve the Academy's Eastwood fetish. 2. I don't think Clint intended Torino to be a comedy, but that's the way it played for my audience. This is revealing of both Mr. Eastwood and my audience. First, all of the movie's "comedy" consists of Walt Kowalski (Eastwood) calling his Hmong neighbors every racial slur in the book. Are we supposed to detest Walt? I certainly did within minutes of meeting him. Or are we supposed to find him funny? Oh, isn't that cute -- he's so ignorant and mean-spirited yet loveable in his own quirky way. Ugh. Imagine if his neighbors were a different ethnicity, say, African American, and the entire movie consisted of Walt calling them every racist word that exists for black people. Would people still find Walt so enjoyable? As for my audience, shame on you. You shouldn't laugh simply because a character uses a racist word. That's not comedy. Films have to earn their laughs, and relying on hackneyed racial slurs doesn't cut it. 3. The acting from everyone besides Eastwood is amateurish. Bee Vang's performance as the next-door boy, Thao, never felt natural or believable, and Ahney Her's delivery as Thao's sister sounded consistently forced. I won't even address the cringe-inducing turns by the Hmong gang members. 4. Eastwood's direction is not known for its subtlety. I can never forget the scene that nearly ruined Million Dollar Baby for me: when Maggie's white-trash family visits her in the hospital, and they're wearing shirts from Universal Studios! Eastwood rarely trusts his audience to figure things out for themselves, so he pounds and pounds away. This happens all over the place in Torino, but two examples particularly come to mind. The first is when Walt gives Thao his Silver Star medal. Why? Oh, there's a reason: so Eastwood can include a slo-mo shot just 10 minutes later of Thao wearing the medal right after Walt's death. See, it's symbolism! Second, during the reading of Walt's will, the lawyer is about to announce who will receive Walt's 1972 Gran Torino. Cut to Walt's granddaughter, who is visibly grinning as if she actually thinks she'll get the car. Come on, Clint. First off, we know the daughter shouldn't be expecting that car since it's obvious to everyone that Walt hates her. Second, even if she did think she had a slight chance of inheriting the car, wouldn't she keep her smile to herself until the lawyer finished reading the will? Nope, this was just another opportunity Eastwood couldn't pass up: "My audience is so stupid that I have to show them one more time how horrible this granddaughter is." 5. As the movie is about to end, the end-titles song starts playing, and it's Eastwood's voice that we hear singing! I was looking forward to exiting this movie theater in peace, and now Clint's raspy voice has to follow me on my way out. I laughed, though, because just when I thought Gran Torino couldn't find a way to get any worse, it did. I got to give Eastwood credit for that -- the man sure is committed.